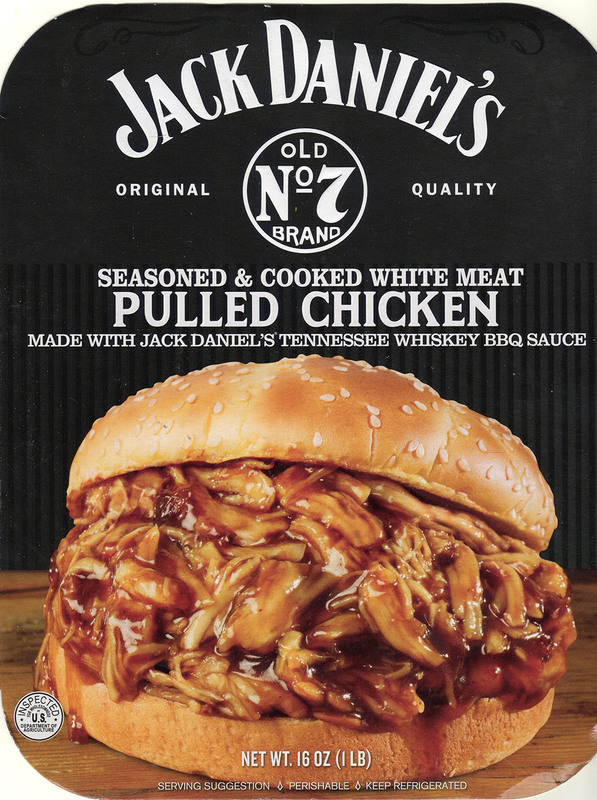 Is Jack Daniel's Pulled Chicken any good? Unless you’re a lover of all things super sweet, a little goes a long way with this product. The BBQ sauce in this pulled chicken is candy like. The pre-cooked strands of chicken are decent enough though. Depending on your personal taste this might make a great ingredient in a number of dishes. Like a moth to the flame, the glossy and stylish packaging of this product drew me in. It’s undoubtedly a handsome package and leans heavily on the Jack Daniel’s brand and name; which may or may not be a good thing to you. 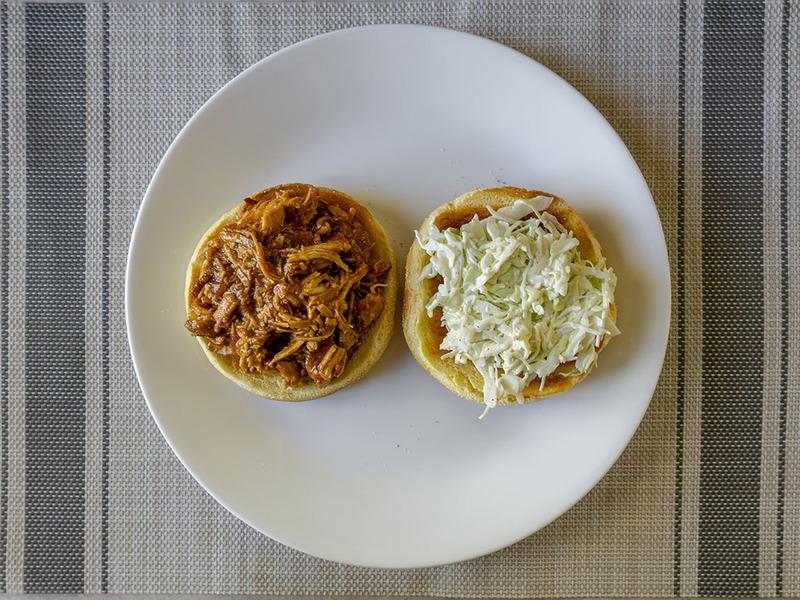 I’ve no particular love or hate for the brand personally, but I was doubly intrigued by the notion or pre-prepared pulled chicken, when most brands offer just pulled pork. Initial inspection was positive, there’s a generous amount of real chicken in an absolute mass of BBQ sauce. The chicken is mostly smaller strands but the few larger chunks I tested were tender, lean and tasty. 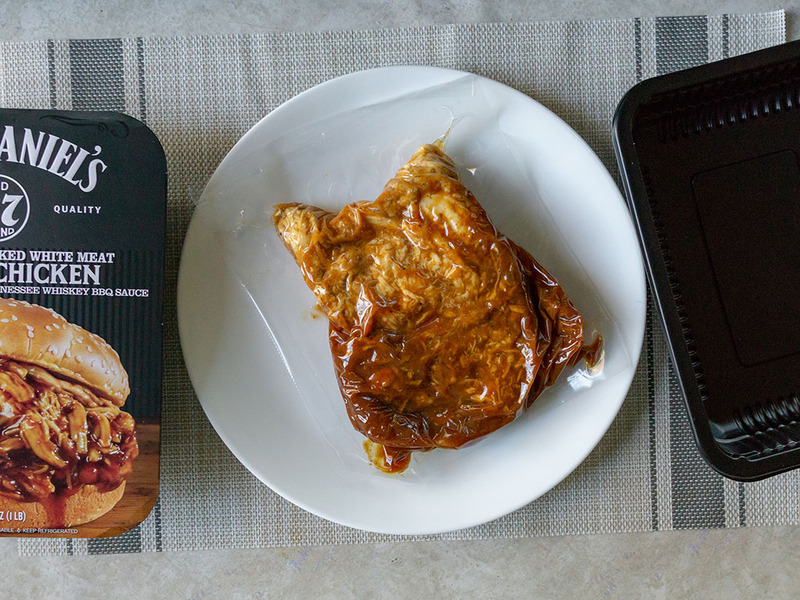 The chicken is also precooked so you’re really just reheating and adding to the dish of your choice, this certainly makes the product a quick meal solution. The biggest issue with this product is the BBQ sauce, it is unrelentingly syrupy-sweet. I don’t have a particularly sweet tooth, and while I know America per se does, this really was pushing the limits for me. I certainly wouldn’t need dessert after a meal using this dish. I’d buy this again, but would use a little creativity in the final use; think dishes that would benefit from a little added sweetness for example. Stood alone as the central ingredient it’s just a little too much I think (see dishes below). 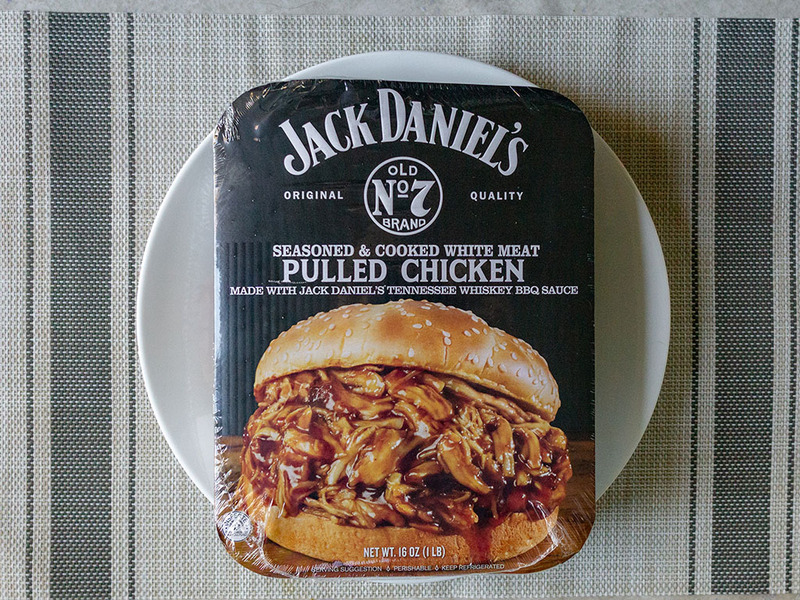 Jack Daniel’s Pulled Chicken – what’s in the box? A plastic wrapped cardboard outer sleeve reveals an internal plastic tray. Within the tray is a sealed plastic bag with the mix of pulled chicken and BBQ sauce. As you can see from the image below, mine had slightly separated; the sauce and chicken not evenly mixed. This took just 30 seconds of bag mushing (technical term) to reintegrate. The plastic package is sturdy enough to man handle pretty roughly. The bag offers no way to reseal once opened. I didn’t want to eat the whole package in one dish, so separated the plastic package into separate air tight containers in the fridge. While the package doesn’t say this is acceptable, my logic went as follows: its cooked chicken, it should last a few days stored safely, you have to remove the plastic bag for cooking in the oven anyway. A little really goes a long way. 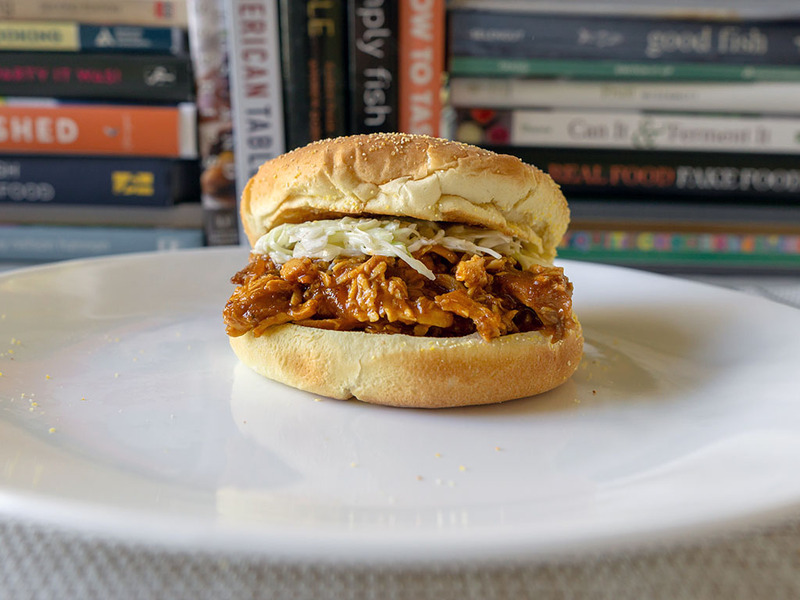 In the pulled chicken sandwich below, I found the sweetness of the BBQ sauce too much, I should have used less and added more acidic toppings to balance things out. My bad. More successful (and not pictured) was an enchilada that I filled with just a little of the pulled chicken – mixed with some refried beans and pan sautéed fajita veggies; this was far superior and using a judicious amount added a pleasant sweetness to the dishes heat – not unlike a chicken barbacoa of sorts. Id make this again in a heart beat. Eaten in the right portions this isn’t too bad at all nutritionally. Cooking offers two options, and encourages the cook to go ahead and prepare the package all in one go. As mentioned above I portioned the container into two, to cook over two meals. If I purchased this again, I would heed the packaging and use it for three or four meals even. The sauce really is super sweet. 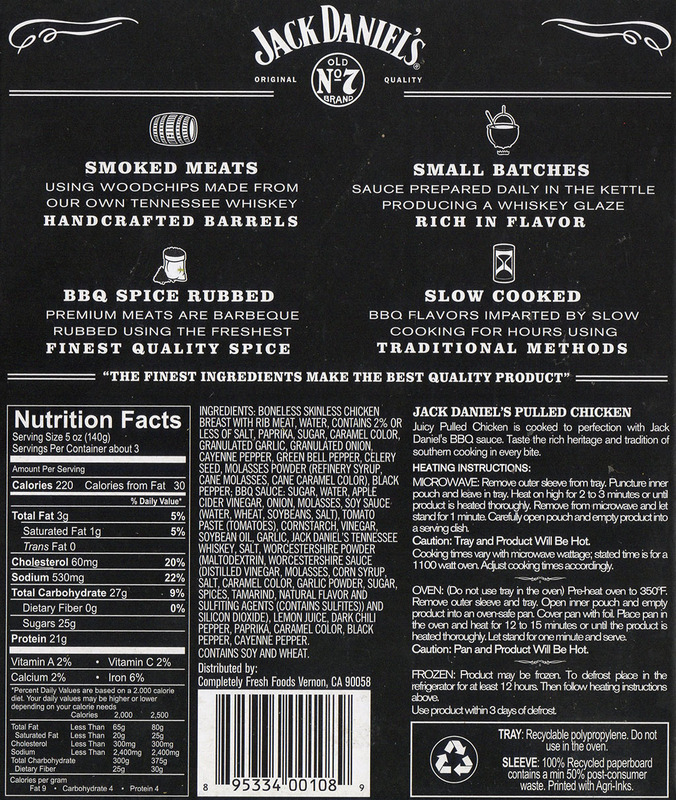 Jack Daniel’s Pulled Chicken – what’s a fair price? I paid $6.97 at a local Walmart. Used to provide three meals that would work out to around $2.30 or so which seems fair to me. If I saw this product on sale much below, say around the $5 mark, it would be a great deal.